Intermediate rock climbing trip that builds skills and confidence. Designed for climbers aged 14-17, this specialty trip is for the bold at heart. Some experience in rock climbing and lots of enthusiasm for the sport is encouraged. Just like on all Wilderness Adventure trips, the 1 Week Rock Climb Trip is a fully outdoor experience. You will camp in backpacking tents, cook backpacking meals on Whisper-lite stoves, and share the accomplishments of each day with your group and leaders by the fire each night. For the Rock Climb trip you will start on our 50' rock wall to learn basic climbing techniques and also be trained in belaying by our American Mountain Guide Association (AMGA) certified instructor. 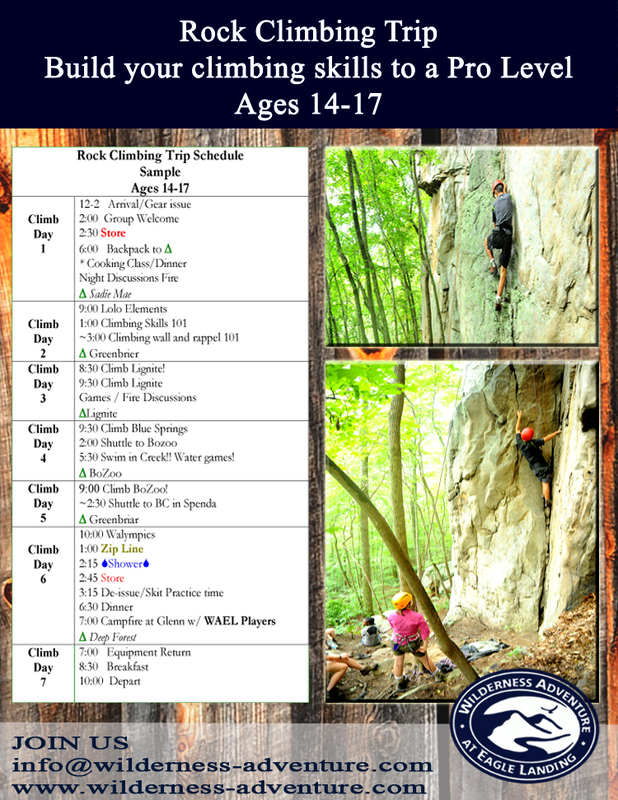 Over the next couple of days you'll head out to three different natural rock sites where you will continue to build your skills as you climb, rappel, and learn cool terminology like crimper, crux, and mantel. When you are not belaying and gripping rock you will have time to relax, rest those sore arms, and take naps in the sun while looking at stunning views of the Blue Ridge Mountains. On the traditional last day, the campers will participate in all camp games, ride our 900' Zip Line, eat a home style spaghetti dinner, and conclude the trip with our campfire led by the staff with skits and songs. You can look at a sample schedule of the trip to the right. We provide all backpacking, camping, and activity gear for the Rock Climb trip. You need to provide clothes and hygiene items for your time at Wilderness Adventure. Although we do provide all necessary climbing gear, having your own helmet, harness, and climbing shoes can make a real difference for this trip. These items can be ordered through our Base Camp Store, or found at any outdoor retailer. You can check out our Packing List to see what gear or clothes you may need to buy for the trip.